Mainly small hacks or solutions for problems I run into and can't find elsewhere. Most posts are related to Microsoft Exchange, PowerShell and Tasker. Looking forward to find a use for Raspberry Pi shortly. Wouldn't it be nice to collect data using a Google Sheets Form and be able to get each cell value from a script on your phone or computer? It can be done. I'm assuming the data you need for your script is already in a Google Sheet. It could be collected using a form or similar. To get unauthenticated access to a Google Sheet it needs to be published. Either publish the sheet containing the data or create a and publish new Google Sheet to hold only the data needed for the script. Import the data to that new sheet using =IMPORTRANGE(). To get the URL for the published sheet, have a look at this page: https://developers.google.com/gdata/samples/spreadsheet_sample. Basically you just need the key for the sheet. We just need to split the content on <content type='text'> and then split the second part again on </content>. The cell data is in the first part of the second split. The content of A1 in the Google Sheet is now in Tasker variable %Value. You could use this to trigger other Tasker tasks or to present that value on a Zooper Widget, or send it to Pushover. I use it for a few things, and might write a more detailed end-to-end post on that. By default Microsoft Exchange creates email addresses on the form First.Last@domain.com. If you change the email address policy to use lowercase, the existing email addresses are not updated to reflect that change. It doesn't work to change the primary SMTP address to lower case right away, since email addresses are basically case insensitive. When you set a new primary SMTP address, the old address is kept as an alias email address. Exchange can't set a new primary email address since the same address already exists as an alias. More or less, you get the picture. Set-Mailbox -Identity $Mailbox.Identity -PrimarySmtpAddress "dummy@domain.com"
In Exchange 2013 it can be a bit hard to find mailboxes that are close to their quota limits. You can see it in the Exchange Admin Center, but that is a tedious task if you want to check all mailboxes. You can also wait for the users to contact you when they get a quota warning, or when they no longer can send email. That's a bit late. With PowerShell you can easily find out the mailbox size, but the quota limit is either Unlimited, which means that the mailbox database defaults are used, or it can be set at a certain limit. TGet-MailboxSizeQuota.ps1 returns all mailboxes above a certain quota (ProhibitSendQuota) usage. TGet-MailboxSizeQuota.ps1 returns all mailboxes with a quota usage of 80% and above. If you want to check for another quota limit, pass the percentage as a parameter. # If the mailbox quota is Unlimited, then the database defaults are used. This can easily be added as a scheduled task. Just make sure to run the task under a user account that has enough rights in Exchange. The following script exported the full mailbox, ignoring the date range in ContentFilter. I couldn't figure it out. Found a lot of people with the same problem. I finally found a solution here: http://occasionalutility.blogspot.com.au/2014/03/everyday-powershell-part-17-using-new.html Turns out it will only accept dates in US formats, and since I'm in Sweden it just failed. $filter = "(Received -gt '"+$StartDate+"') -and (Received -lt '"+$EndDate+"')"
I already mentioned Pushover in a previous post, but essentially it's a tool to send notification to mobile devices (Android and iOS). I wanted a way to locate my mobile phone in case it's lost. There are many apps that can do this already, but with Tasker you can do it yourself. I didn't even have to figure out how to do it myself, as a good recipe is already available on a Tasker Wiki. There are some variants on that site and I ended up with the tasker code below. To find your phone, send a text message to your lost from from any other mobile phone with <your keyword> in the message. Tasker will trigger, get the phone location using any of the methods available (GPS or WiFi positioning) and send back a text message with a Google Maps URL with your lost phones position mapped out. URL part and ended up with a new step four in the Tasker Task. 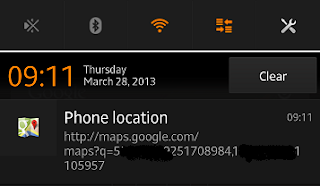 In addition to the Tasker script, I created a new Pushover application, added a Google Maps icon and that was it. When I send a text with my keyword I get the following Pushover notification on all my devices. If you want to use the code above, you just need to change <your keyword> to a keyword of your choice. This is the word you need to text to your lost phone to trigger the Tasker Profile and Task. In the code you also need to replace <user token> and <app token> if you want to use Pushover. Pushover is a platform for sending and receiving push notifications to mobile devices (Android and iOS). Pushover is free, but requires the installation of a paid app on your Android or iOS device. After you set up your account on Pushover you get a user token that is used to identify you as the sender of a notification. To send notifications, create a new application on the Pushover site. Give it a name, select type and upload an icon. After the application is registered you get an application token that identifies your application. message = "Your computer just rebooted"
Nothing special about the script, basically it's a slight modification of an example script found on the Pushover FAQ. Just replace <app token> and <user token> with your own tokens. Next, I need to have the script run when the computer starts, and run before anyone logs on. That's the point, right, if I'm at the computer I don't need a notification telling me the computer restarted. Run the Local Group Policy Editor (gpedit.msc) tool as administrator and drill down to Local Computer Policy -> Computer Configuration -> Windows Settings -> Scripts and open Startup. Go to the PowerShell Scripts tab and click Add. Click Browse next to Script Name and locate your script. Click OK, OK and then close the policy editor. Just found PowerShellBooks.com (http://bit.ly/11Cf4Dw) that lists a number of PowerShell books, and also provides three books for free download in PDF format.